​I remember sitting on the floor of DFW International Airport with strangers who would soon become close friends, talking about how surreal this experience that hadn't yet begun was going to be, how surreal it already was. Twenty-two students, myself included, enrolled in the Human Development and Family Sciences Maymester that would take us all around Italy, learning first hand about the unique systems of early childhood education across the country. The cities of Reggio Emilia, Florence, and Rome served as our homes for the duration of our program, and we stayed roughly a week in each place. We had free weekends to strike out on our own and explore the city we were in or travel somewhere new, like Venice, Capri, and Pisa. Ellen, our API godsend and mother for the program, helped us figure out everything from train times to food recommendations, so we were never without guidance. We also had trips with the program to places including Parma, San Gimignano, and Pistoia. These planned excursions were incredible, offering us unique experiences like tasting true Parmigiano-Reggiano cheese from a local factory, eating a homegrown meal at a bio-farm in Tuscany, and, arguably the best excursions, visiting Italian schools. The school visits were the highlight of the program for many of us, reading about the different educational approaches was interesting, but living them was amazing. Our first full day in Italy we got to visit Paolina Poggi School, a Montessori school just outside of Rome that serves kids from four months to 12 years of age. This was our first school visit, we were nervous and excited and not really sure what to expect, but the staff was incredibly helpful and accommodating, answering all of our questions about how the approach we read about is actually applied. In Reggio Emilia, we had class at the Loris Malaguzzi Center, the international hub for the Reggio Emilia approach to early childhood education. There, we experienced first-hand the prioritization of community and art in these schools. We took a daytrip to Pistoia to learn about their municipality's approach to educating their children and marveled at the seamless integration of nature and family into those schools. While we were in Rome, we even toured and had lectures at La Sapienza, the largest university in Italy and one of the best research institutions in the world. We listened to lectures from esteemed faculty from universities across Italy, including our beloved Roberto Baiocco who, on our second night in Italy, welcomed all of us into his home for a delicious Italian meal on his beautiful rooftop garden. Ventidue women from across UT took on Italy for a month together. We went through homesickness and real sickness and Rome public transportation and cross-country train rides and three lost/stolen phones and late-night conversations and sunsets on the Arno River and the quest for the best gelato (spoiler: it's all the best) together. I started the program not knowing a single person, and I ended with some really great friends, amazing memories, and a lifetime of never being able to eat normal ice cream again. I also ended the program with an acute awareness of how little I know about the world and the people and cultures within it, a feeling that is both scary and exciting. I thought I knew a lot about education and about children, but I was wrong in the best way. Maria Montessori said, "Early childhood education is the key to the betterment of society." This seemed to be an ideal Italians cherished. From my observations and in conversations with teachers at the Italian schools, it became obvious that Italian children are a respected people by their communities, and a huge emphasis is placed not only on their wellbeing but their education as well. In my experience, adults in the US view children as a separate class, set apart from other citizens. Rarely are they given the respect I saw in Italy, respect for their personhood, for their ideas, for their ability to make contributions to society. The way we view, treat, and educate children in the US is not universal. That means, though not easy, it is changeable. Children are the future. I believe it now more than ever because I got to experience a culture, a whole country, that not only believes it but acts it. 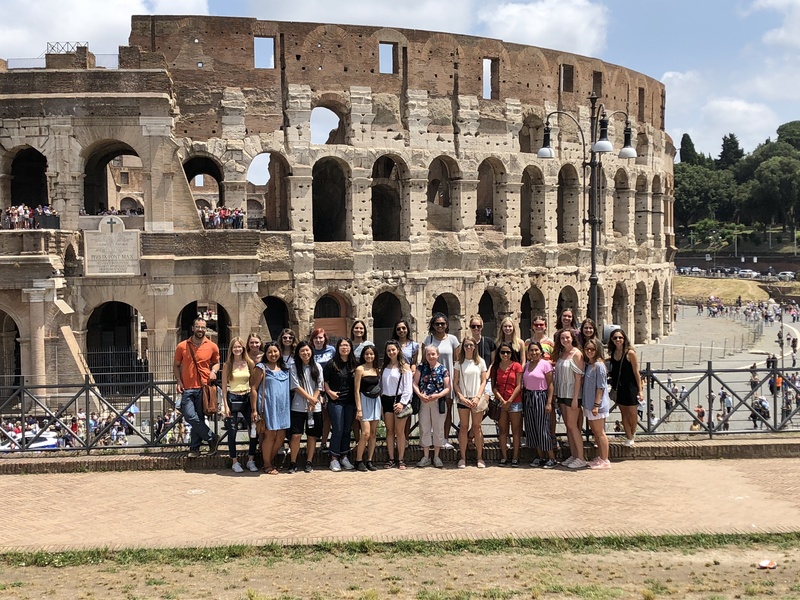 ​Faculty members: Dr. Salvatore Ioverno, HDFS Lecturer, and Hallie Speranza, HDFS Associate Professor of Practice visit the Colosseum with Maymester 2018 students.